NEW YORK (GenomeWeb News) – The funding squeeze from the sequestration of the US federal budget, now more than half-a-year old, has already had a sizable impact at the National Human Genome Research Institute, leading to cuts to ongoing programs, scaling back of new ones, and the deferring of efforts that have not yet launched. The five percent cut in funding this year at NHGRI has led not only to trimmed-down renewal grants and fewer, smaller awards broadly, but also has chopped the budget for some of the institute’s important programs, according to NHGRI Director Eric Green. The programs that have either had their funding reduced, and in one case delayed, include the ENCODE (Encyclopedia of DNA Elements) program, projects focused on using genome sequencing in newborns and in clinical medicine, and other initiatives, Green said in his Director’s Report to the National Advisory Council on Human Genomics Research this week. In addition, many renewal grants have been trimmed, and there are “numerous examples of detrimental cuts” to the institute’s intramural research program, said Green. These cuts to large and small NHGRI programs come at a pivotal time for genomics, he noted, as the products of such research are beginning to translate into clinical possibilities. “It is tragic. [That] is the word I would use,” Green told GenomeWeb Daily News this week. “[The field of genomics] is just so exciting. There are so many opportunities,” he said. “This is precisely the time that we should be pushing the accelerator hard, and we just cannot do it because we don’t have enough fuel in our fuel tank. ENCODE, a decade-old flagship project at NIH that aims to identify all of the functional elements in the human genome, had its budget reduced by 16 percent. The Genomic Sequencing and Newborn Screening Disorders program was cut by half, which left the program to fund fewer research projects than planned and its research consortium to go forward without the benefit of a data coordinating center. This new initiative, an effort to support pioneering studies on how sequencing might be used in the care of newborns and in neonatal care that was created jointly with the Eunice Kennedy Shriver National Institute of Child Health and Human Development, had its budget cut from $10 million to $5 million. The Genomic Medicine Pilot Demonstration Projects program had its budget cut by 20 percent, and NHGRI’s Bioinformatics Resources and Analysis Research Portfolio had $5 million sliced out of its budget. The new Genomics of Gene Regulation (GGR)request for applications was bumped out of this funding year entirely, and has been delayed until 2014, according to Green. Because the sequestration plan was concocted and agreed to well in advance of its arrival earlier this year, Green told GWDN that the institute did have some time to try to react to the sequestration and mitigate the pain from the cuts, spreading them around fairly and evenly while maintaining priorities. He said leadership at the institute tried to prepare for the possibility of sequestration by being conservative in its planning. Programs that were already ongoing, like ENCODE, were likely to take priority over those that were not yet launched, like GGR, in part because the infrastructure is already in place for ongoing projects and because it is easier to plan for how they operate and generate outputs, like data. Green said some of the projects being cut or delayed were created under NHGRI’sstrategic plan, a program it laid out in 2011 that involves restructuring of the institute’s divisions and some shifting in its research portfolio to include more efforts in applying genomics to medicine and healthcare. “Some of these RFAs that we delayed really represent key elements that we started to anticipate two years ago,” said Green. “We knew we wanted to do more in sequencing, we knew we wanted to do some pilot projects in genomic medicine. We knew we wanted to continue to accelerate efforts in understanding how the genome works … ENCODE, GGR, and so forth. It just had to be slowed down,” he said. Anastasia Wise, program director for the Genomic Sequencing and Newborn Screening Disorders program, told GWDN that the program was supposed to be much larger than the $5 million in awards unveiled last week, which funded a consortium of four research projects. Wise said NHGRI and NICHD were each initially planning to provide double the amount of funding they were actually awarded, which is now expected to be a total of $25 million over five years, although that total could be subject to the availability of funding. She said the program “wanted to be able to make more awards, and we wanted to be able to fund a coordinating center to be able to bring the network together and help provide some harmonization of data and coordination of logistics between the different members of the consortium,” but it was unable to fund that part of the effort. Although the fractured fiscal culture in Washington engenders caution at NHGRI as the agency looks forward, Green sees many scientific opportunities right now, as genomics begins to hit the clinic. “Some people are saying we are not even going fast enough,” he said. “Lots of people have been discussing what the world is going to look like when somebody gets their genome sequenced in the newborn period, and [they] think about what the implications of that are for the patient for the rest of their lives. We want to start studying this,” he said. Matt Jones is a staff reporter for GenomeWeb Daily News. He covers public policy, legislation, and funding issues that affect researchers in the genomics field, as well as the operations of research institutes. E-mail Matt Jones or follow GWDN’s headlines at @DailyNewsGW. 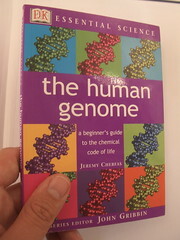 Author, Writer and Curator: Stephen J. Williams, Ph.D.
Sequencing of the human genome via massive programs such as the Cancer Genome Atlas Program (CGAP) and the Encyclopedia of DNA Elements (ENCODE) consortium in conjunction with considerable bioinformatics efforts led by the National Center for Biotechnology Information (NCBI) have unlocked a myriad of yet unclassified genes (for good review see (2). The project encompasses 32 institutions worldwide which, so far, have generated 1640 data sets, initially depending on microarray platforms but now moving to the more cost effective new sequencing technology. Initially the ENCODE project focused on three types of cells: an immature white blood cell line GM12878, leukemic line K562, and an approved human embryonic cell line H1-hESC. The analysis was rapidly expanded to another 140 cell types. DNA sequencing had revealed 20,687 known coding regions with hints of 50 more coding regions. Another 11,224 DNA stretches were classified as pseudogenes. The ENCODE project reveals that many genes encode for an RNA, not protein product, so called regulatory RNAs. Figure. Insertional mutagenesis based on transposon-mediated mechanism. A) Basic structure of transposon contains gene/sequence flanked by two inverted repeats (IR) and/or direct repeats (DR). An enzyme, the transposase (red hexagon) binds and cuts at the IR/DR and transposon is pasted at another site in DNA, containing an insertion site. 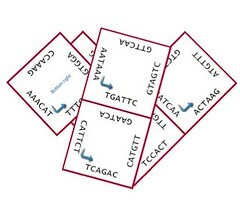 B) Multiple transpositions may results in oncogenic events by inserting in promoters leading to altered expression of genes driving oncogenesis or inserting within coding regions and inactivating tumor suppressors or activating oncogenes. 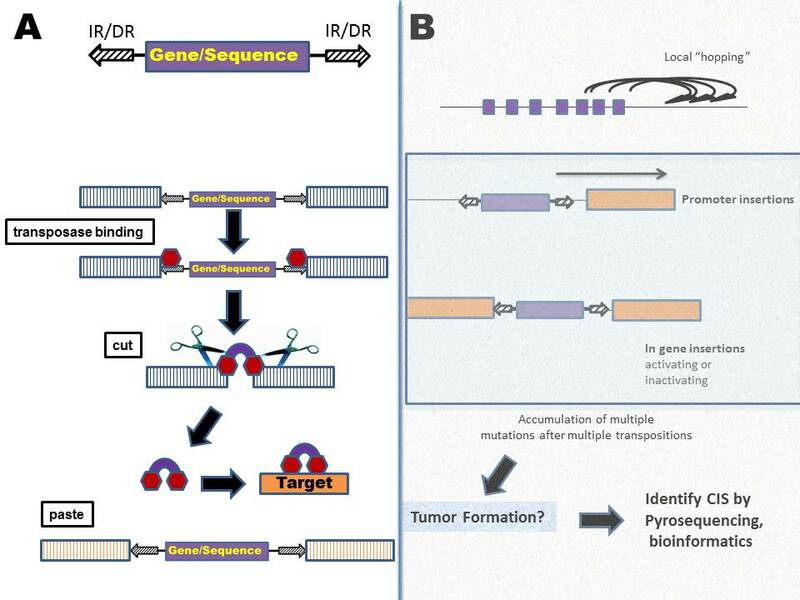 Deep sequencing of the resultant tumor genomes ( based on nested PCR from IR/DRs) may reveal common insertion sites (CIS) and oncogenic mutations could be identified. In a bioinformatics study Eunjung Lee et al. (1), in collaboration with the Cancer Genome Atlas Research Network, the authors had analyzed 43 high-coverage whole-genome sequencing datasets from five cancer types to determine transposable element insertion sites. Using a novel computational method, the authors had identified 194 high-confidence somatic TE insertion sites present in cancers of epithelial origin such as colorectal, prostate and ovarian, but not in brain or blood cancers. Sixty four of the 194 detected somatic TE insertions were located within 62 annotated genes. Genes with TE insertion in colon cancers have commonly high mutation rates and enriched genes were associated with cell adhesion functions (CDH12, ROBO2,NRXN3, FPR2, COL1A1, NEGR1, NTM and CTNNA2) or tumor suppressor functions (NELL1m ROBO2, DBC1, and PARK2). None of the somatic events were located within coding regions, with the TE sequences being detected in untranslated regions (UTR) or intronic regions. Previous studies had shown insertion in these regions (UTR or intronic) can disrupts gene expression (9). Interestingly, most of the genes with insertion sites were down-regulated, suggested by a recent paper showing that local changes in methylation status of transposable elements can drive retro-transposition (10,11). Indeed, the authors found that somatic insertions are biased toward the hypomethylated regions in cancer cell DNA. The authors also confirmed that the insertion sites were unique to cancer and were somatic insertions, not germline (germline: arising during embryonic development) in origin by analyzing 44 normal genomes (41 normal blood samples from cancer patients and three healthy individuals). The authors also suggest that more bioinformatics studies, which utilize the expansive genomic and epigenetic databases, could determine functional consequences of such transposable elements in cancer. The following Post will describe how use of transposon-mediated insertional mutagenesis is leading to discoveries of the drivers (main genetic events) leading to oncogenesis. 3. Park, A. (2012) Don’t Trash These Genes. “Junk DNA may lead to valuable cures. in Time, Time, Inc., New York, N.Y. The post has touched upon several aspects of miRNA including origin, function, and mechanism of action. This commentary is an extension of Dr. Baker’s post, expanding upon the mechanism of action of miRNAs along with their role in potential disease therapy. MicroRNA were not discovered long back, infact, it was in 1998 when the presence of the non-coding RNAs that could be involved in switching ‘on’ and ‘off’ of certain genes. In the last decade, 2006 Nobel Prize for medicine or physiology was awarded to scientists Andrew Fire and Craig Mello for their discovery of this new role of RNA molecules. A breakthrough research was published in the September 2010 issue of Nature journal, stating that mammalian microRNAs predominantly act by decreasing the levels of target mRNA. Mammalian microRNAs predominantly act to decrease target mRNA levels. miRNAs were initially thought to repress protein output without changes in the corresponding mRNA levels. Guo et al challenged the previous notion of ‘translational repression’ and concluded on the basis of their experimental results that ‘mRNA-destabilization’ scenario for the major part is responsible for the repression in protein expression via miRNAs. Authors utilized the method of ‘ribosome profiling’ to measure the overall effects of miRNA on protein production and then compared these to simultaneously measured effects on mRNA levels. Ribosome profiling prepares maps that exact positions of ribosomes on transcripts after nucleases chew upon the exposed part of transcripts that are not covered by ribosomes. MiR-1 and miR-155 were introduced into the HeLa-cell line. Both of these miRNAs are not normally expressed in HeLa cells. Another miRNA used was mir-223 which is expressed in significant amounts in neutrophils. The reason for choosing the set of these miRNAs was that they had already been shown to repress protein levels via proteomics research. It was deciphered that miRNA-mediated repression was similar regardless of target expression level and further stated that “for both ectopic and endogenous miRNA regulatory interactions, lowered mRNA levels account for lowered mRNA levels accounted for most for most (>/=84%) of the decreased protein production.” These results show that changes in mRNA levels closely reflect the impact of miRNAs on gene expression and indicate that destabilization of target mRNAs is the predominant reason for reduced protein output. The p53 gene is known as a tumor suppressor gene and its inactivation has been associated in some cancers such as neuroblastoma. The study reported that microRNA-380 (miR-380) was able to repress the expression of p53 gene in cancer patients causing uninhibited cell survival and proliferation. The research group was able to decrease the tumor size in vivo in a mouse model of the neuroblastoma by delivering miR-380 antagonist. The researchers also observed that the inhibition of endogenous miR-380 in embryonic stem or neuroblastoma cells resulted in induction of p53, and extensive apoptotic cell death. Thus, the success of miR antagonist for decreasing tumor size speaks of the effectiveness of miR as a potential therapeutic target for cancer treatment.